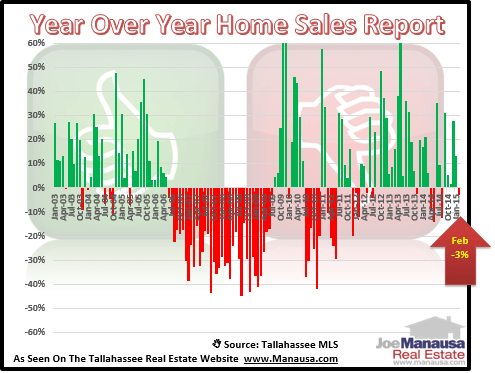 We track the number of homes sold in Tallahassee each month, and then compare it with the same month in the previous year in order to determine how the real estate market is improving (or not). We refer to this as the "year over year" home sales report, and since home sales are still very low when compared to the past twenty years, we expect to see far more gaining months than declining months for the foreseeable future. Unfortunately, for the first time in six months, the year over year home sales report was negative for February. The following real estate graph simply shows the gain (green) or loss (red) as a percentage when compared to the same month the previous year. By way of example, the small red bar in February 2015 shows a 3% decline when compared to February 2014. February's decline was only the fifth declining month since the Summer of 2012, so it is not something that we consider to be negative at this time. This graph is so valuable because you really don't need to see figures, the colors really tell the story. There has been a lot of green and very little red in the past two years, but take a look at the 39 consecutive months of red during the crash of the housing market. When we see a lot of red, the market is falling. When we see a lot of green, the market is rising. Needless to say, we love seeing the green, it means the housing market recovery is well under way. 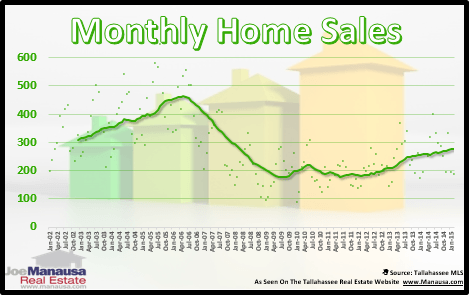 This next graph shows the number of closed home sales in Tallahassee each month as a green dot, while the green line shows the one-year average of monthly closed home sales. As we learned from the previous graph, the market is improving. We can also see it in the trend line above. But this graph provides key insight as to exactly how far the Tallahassee real estate market has recovered. Note how the current trend (about 276 homes sold each month) is still well below where the trend line was in 2002 (310 home sales per month in 2001). This means that monthly home sales today are roughly 11% lower than they were 14 years ago, and they are equivalent to the numbers reported 23 years ago. Considering our population has grown more than 40% since that time, we should expect to see more homes selling than the current market is reporting, and it is why we still have expectations for growth. Combine our historical norm with the fact the home values are low and mortgage interest rates are low, we expect to see more gaining months this year than losers. If you would like to know more about using Tallahassee real estate market analytics to your advantage, just drop me a note and we can schedule a time to review your needs, wants, and goals.